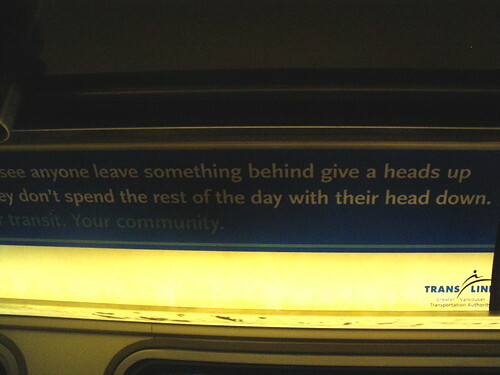 I get on the bus this morning, and learn from an advert that people need to be reminded to give a “heads up” if they see someone leave something on their seat. The dispiriting part is that I don’t doubt such a notice is needed. The group, made up mainly of student volunteers dedicated to organizing cultural events across the country, is launching a new microbrew in Vancouver this month, believed to be North America’s first not-for-profit beer. But the idea behind the beverage is more complex than simply providing a new drink: The group hopes to get students talking about politics and other social issues when they gather for a brewski. Like other student-oriented groups such as Rock the Vote, uberculture is organizing activities around the Jan. 23 [Canadian] federal election. … The group has teamed up with Backwoods Brewing to produce the ale, which will be an “open source” beer, meaning the recipe will be available on the Internet. They’re using local ingredients for the hemp-based beer and selling only to locally owned bars in B.C.’s competitive microbrew market. If you live in Vancouver, you can buy überbrü at The Railway, Rime, and the Foundation restaurant, which are among the coolest spots in the city — you can also get it at Wazubees, which is not. Oh, the shame of a country mouse who thought Wazubees was such a quintessential Vancouver/Commercial experience last week. Crannog Ales on tap! And now open-source brew. But now my illusion of hipness has been shattered by three dismissive words. Jeremy — trust yourself, I’ve got my own baggage. (and the one on Commercial is better than the one downtown. Wait, you were in town? D’Arcy — don’t know, I’ll try it and report back. Truth be told, “quintessential” was a word chosen for melodramatic effect…but we did have a good meal there and the experience was fun. I had never spent any time in that Commercial Drive area and it made a great impression. Our long-time old friends just moved to a place on 1st Ave and Nanaimo — is that anywhere near where you guys are? Hmmm, it’s funny that you saw the message on the bus as dispiriting. I guess I understand, it seems obvious that one should do this without having to be ‘told,’ but my take on it would be that we live in a pretty good society when this is the harshest invocation one sees on public transit. Contrast this with my experience getting onto a bus in San Antonio, Texas, which had a ‘No Guns Allowed’ sticker (forgot to get an image, but similar to this one http://www.flickr.com/photos/dansstuff/1147035/) on the side of the bus. That had me worried – you mean you actually have to tell people not to bring their guns with them! And I take issue with your characterization of The Foundation… OK, it has the quotations on the wall, but vegan, Gadzooks! Put it this way: it’s not the Railway Club. Jeremy — I know you have other stuff on the go in Van Rock City — just disappointed we keep missing each other. (I still feel bad we weren’t able to barge in on you last summer.) You probably should know that I eschew Wazubees on the Drive for Avanti’s across the street — which is as unhip a bar as you can imagine… just like any small town lounge, which I suspect is perversely why I like it. But tell you what, next time you’re in Zubee’s or anywhere else on The Drive give me a call and I’ll buy you a round. And we don’t live too far at all from your friends. We’re closer to Hastings-Nanaimo, which I’m told is what The Drive was like before it got cool. Wonderful stretch, we love it, but it lacks a watering hole of any kind. Scott — good point. It is a quaint set of implied values, and reassuring in a modest Canadian sort of way. I meant to write in the post that a year or so back I left a bag with some incredibly important and irreplacable documents on a bus (thankfully recovered)… I can’t overstate how bad it would have been to lose that stuff, other than somebody having a health crisis due to my negligence, I couldn’t have felt worse. I honestly came close to a breakdown that night. I’m beginning to think this post says a lot more about my own weirdness than it does about people’s consideration on transit, or open source beer. This post is not going at all well for me.